I want to keep coming back, really I do. Your prices are far better than my local stores and even somewhat better than your chain competitors. It’s worth it financially for me. But, man oh man. It’s a rough trip. And, I’m all for exposing my children to the filth diversity of your plentiful clientele, but not willing to expose them to scurvy. Where are the Handi-Wipes? And the mouth masks? It frightens me. Really. You know we love you, right? Hate your hair. Hate it. Hate it on my wood floors, hate it on my black clothes, really hate it on my bed. I know we let you sleep there for six years but it was a lot cuter when you were 10 lbs than it is now that you’re 80 lbs and shedding. Get off. You have your own bed. Use it. There’s a pound around the corner and, I promise you, their cold, dank floors are not as comfy as your Orvis bed. Your show is weird. Just plain weird. 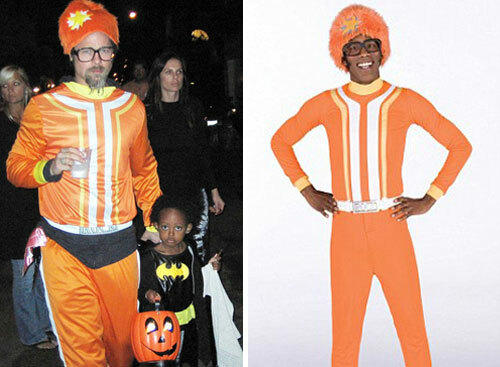 You’re the Telletubbies of my kids generation. I don’t get it. Kids love you. Grown-ups? Not so much. And, don’t let the Brad Pitt thing go to your head. He dresses like a homeless person most of the time so your orange jumpsuit was an upgrade. As soon as I can get my hands on the DVR remote, your days are numbered. OK. Kids sleeping through the night. Lost some weight. Settled into my new home. Come on back, old friend. Welcome. I’ve been using you every day since I was 14. So, if you’re not helping me look younger too and I’m a wrinkled old raisin at 60, I’m coming after you. And, $4.59 once every two months for 46 years ain’t gonna be cheap. Just sayin’. 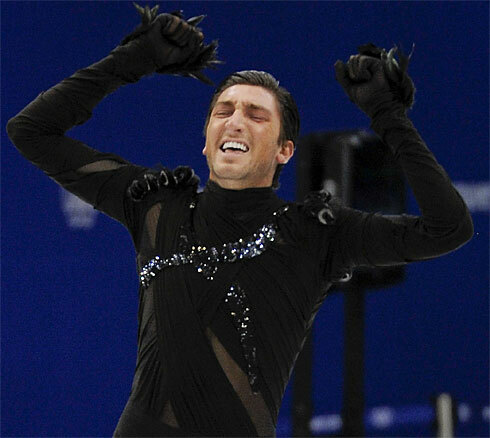 Here’s what you wore last night for the Short Program. 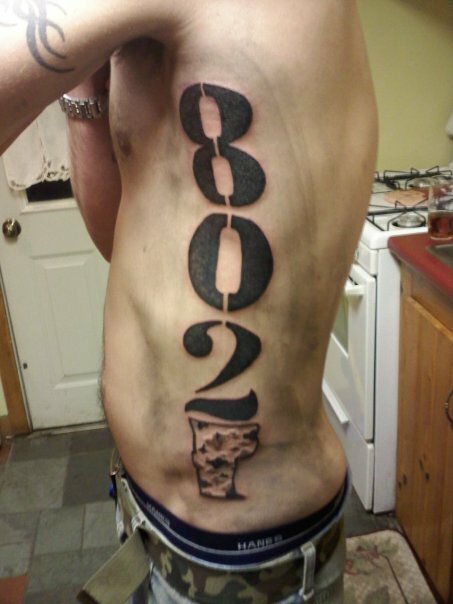 Are those curly q’s on your shoulder blades? Feathers on your fists? Got my hair cut and colored the other day. As usual. Cut about an inch off. As usual. Left feeling rather glamorous. As usual. Then, on the very next day, looked almost like I never went. As usual. But, this time I did think to ask for some advice on how to make my hair look less dry and my hairdresser (who never pushes anything on me) asked what shampoo I use. Me: Ummm. Well, not really anything in particular. Me: No, I actually just buy whatever smells the best to me at the time. C: At the grocery store? Me: Sometimes. When I’m at my mother-in-laws because there’s some in the shower. Or sometimes I’ll use Husbands’ 2-in-1 Head & Shoulders. I think that has conditioner in it. I’m such a lost cause. Husband came home that night and gave me the usual thumbs-up on the day-of hair do. I shared with him that I got some advice on my hair and was optimistic about what was sure to be my new shiny, healthy hair due to the amazing shampoo and conditioner I had just purchased. Yay, me! Husband: Just what you need, huh? More products. I laughed. Because, there could be absolutely no possibly way that he was serious. And maybe he was. Here below you can see my extensive collection of shower products. Note my exciting new shampoo and conditioner. 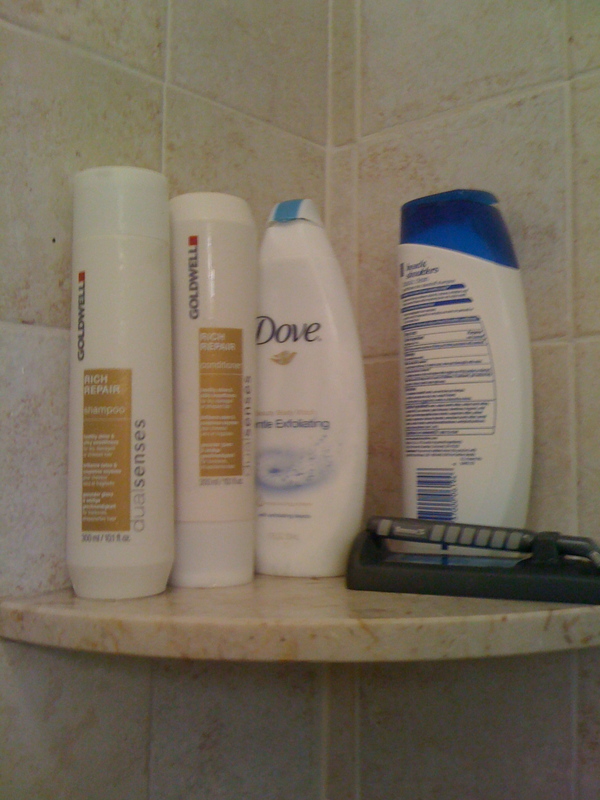 Body Wash is made by Dove, probably cost $2 and has probably been sitting in the same spot in the shower for a month because I lost the loofah. Aforementioned H&S shampoo is not mine. 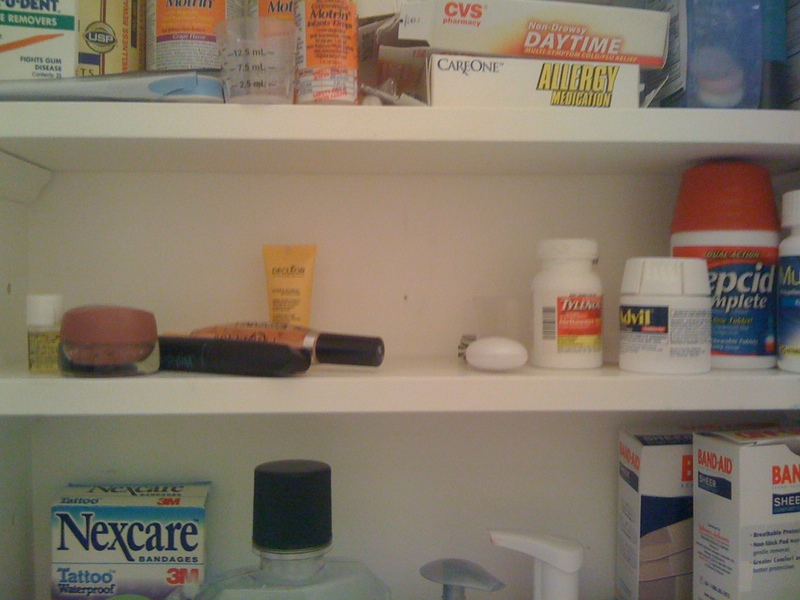 And here, on the left side of the middle shelf of our medicine cabinet is my complete make-up collection. Really. Again, note the staggering array of high-cost brands including such notables as Bonnie Bell lip gloss and Maybelline mascara. Rodeo Drive, here I come. 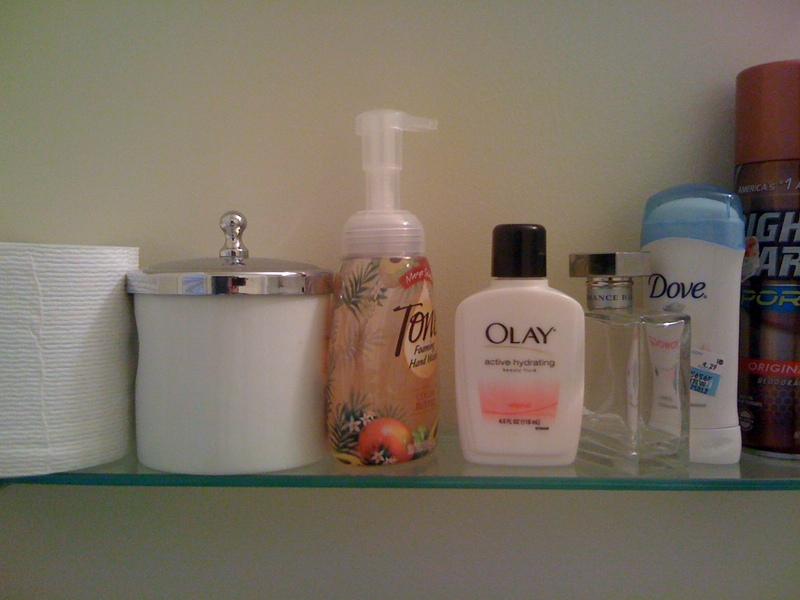 And finally, my additional “vanity items” – Oil of Olay, Ralph Lauren Romance perfume and Dove deodorant. Right Guard, of course, is his. Anything left of the Oil of Olay is “ours”. So, there you have it. I certainly may be high-maintenance in other ways but products?! Ha. I will not be branded with the Scarlet P. Nope. Not me. Bring on the $15 shampoo. I think I deserve it.